The American Association of Orthodontists recommends that all children, regardless of their orthodontic progression, receive an orthodontic evaluation by age seven. Early examination allows orthodontists to determine the best time for orthodontic treatment, and if necessary, to begin. Early interceptive orthodontic therapy can minimize the need for more complex treatment in the future. By the time children reach adolescence, their permanent teeth are either in, or are erupting. Teenagers jaw bones are almost finished growing, making this an ideal time to correct their teeth. People whose teeth are crooked or misaligned are often self conscious about their appearance. By starting early, you can give your child a healthy smile with a lifetime of benefits. Seeing our patients grow and mature into confident young adults is one of our greatest rewards. No matter what your age, appearance is an important aspect of your life. You are never too old for orthodontic treatment. In fact, thirty percent of our patients are adults. Many adults seek orthodontic treatment not just for the sake of their smiles, but to improve the function of their bite. Adult orthodontics are more convenient and comfortable than ever. Technological advancements have made adulthood a great time to achieve the smile you have always wanted. There are a variety of options in styles of braces or brackets, from the raditional metal brackets to a less visible type. Check out the choices and discuss the options at your first visit. Traditional braces or brackets are the most common type and are made of high-grade stainless steel. For patients involved in contact sports and for durability, metal braces are a must. They are much different than the large, bulky appliances of past years. Today’s metal braces are much smaller, more comfortable and less noticeable. You also have the option of adding color to your braces at each visit - a fun way to brighten your smile. Dr. Garemani offers the most technically advanced style of “silver” braces today. The newest type is the Damon System. This system uses a slide mechanism, not the conventional elastics, to hold the arch wire in place. This eliminates much of the friction and binding active tooth movement. The brackets provide not only exceptional aesthetics, but quicker treatment time as well! Unlike ceramic braces that are opaque, the clear brackets we offer are crystal clear and virtually disappear onto the tooth. The “ice” brackets won’t stain or discolor and are completely transparent. The clear braces are a popular choice for our adult patients and some teens. Dr. Garemani is a Certified Invisalign® Provider. New advances in orthodontics make it possible to have braces that are practically invisible. Invisalign® is a state-of-the-art alternative to traditional braces that is virtually undetectable to other people. Invisalign straightens your teeth without brackets or wires, just a series of customized removable appliances called “aligners.” If you are considering this option for your orthodontic treatment, Dr. Garemani will be able to determine if Invisalign is right for you. 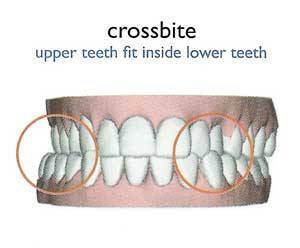 Crossbites can be corrected with Braces or other Orthodontic appliances. An underbite is when the lower front teeth bite over the upper front teeth. This is the opposite of how a normal bite is supposed to be arranged. It could be named a reverse bite and is sometimes cruelly called a bull dog bite. It's opposite of an overbite and is often referred to as a Class III malocclusion. In almost all cases, an underbite is caused by nasal obstruction, mouth breathing and a tongue thrust. The tongue has to stay down so it doesn't block air from getting in. Many tongue thrust patients brace their tongues against the sides of their lower jaws and lower teeth when they swallow. This constant pressure causes the lower jaw to overgrow and creates a mismatch between the larger lower jaw and smaller upper jaw. The result is that only the back teeth touch. In most cases traditional metal braces are needed, but orthodontists are now beginning to use metal braces on the lowers and lingual braces on top. Invisalign treatment for an underbite is usually not effective, because effective treatment may require rubber bands, power chains, and other appliances to get as much movement as possible. Overbite correction is one of the most common forms of orthodontic treatment. With a malocclusion such as this, called a Class II bite, the lower jaw does not reach out as far as the top of the mouth. This can occur naturally, through the wonder and curse of genetics, or through bad habits like thumb sucking. The longer a trait like this is left without treatment, the worse the orthodontic problem can become and the more intensive the treatment required. The orthodontic treatment for proper overbite correction generally requires braces. If overbite treatment begins at an early enough age, with the use of an orthodontic appliance, the use of braces can be minimized or even in some cases avoided. It is generally possible to tell what future orthodontic problems lie ahead for a child by age 7. At this age it is a good idea to get treatment to prevent further problems. A term used to describe forward tipping of the incisor teeth. In children, this generally occurs in response to thumb sucking or other oral habits. In adults, it may occur following the loss of several posterior (back) teeth, which produces excess tipping force on the anterior (front) teeth—especially the four incisors. Periodontal disease may accelerate incisor protrusion in adults, but is not generally a problem for children. The treatment is fairly straightforward and can be started at any time. Essentially it consists of using orthodontic braces to correct the alignment of the teeth. While a number of systems of braces exist, they all involve a combination of wires, brackets and bands which slowly force the teeth to move to their correct location. Modern orthodontics has made great advances in tooth and jaw restoration and can totally transform a person's looks as well as their function. The results are often a complete metamorphosis of the face. With heavy grinding, the teeth tend to wear out faster. In fact, the edges where upper and lower teeth meet may become quite raw and tender. 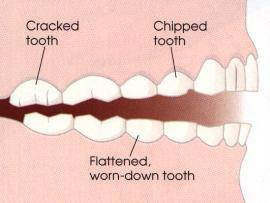 Teeth will also tend to have an evenly aligned appearance because they have been filed down to a straight line. This wearing out can result in the nerve endings becoming exposed, which can then cause the teeth to develop sensitivity to hot or cold. A patient will also find small fractures on the teeth and small pieces chipping off. The condition of your bite also has much to do with grinding. In general, if your bite is comfortable and relaxed, the tendency for teeth grinding is significantly reduced. Another indicator is the headache many people have upon waking up. This is caused by the unnatural tension in the muscles of the jaw. Patients often undergo bite therapy to correct this disorder. A simple TMJ appliance to reduce the effect of heavy grinding is a mouth guard (also known as a nightguard). This is an acrylic device that fits snugly between the rows of your teeth to reduce the effect of teeth grinding on each other. While a mouth guard is not a true solution to grinding, it certainly ensures that your teeth do not get worn down as fast due to the heavy pressure. Most people adapt easily to the use of a mouth guard and enjoy much better sleep as a result. In summary, the way to treat bruxism is through a three-pronged attack. Reduce stress in your life, correct your bite and ensure that there is no residual strain on your jaw when it is in the natural position and finally, use a mouth guard to minimize the damage. Crowding refers to lack of space for the teeth to be normally fitted within the jaws. Due to this lack of space teeth get twisted or displaced. It usually happens when tooth to jaw size does not fit appropriately or the teeth are larger than the space available. Improper eruption and untimely loss of primary teeth also sometimes lead to crowding. MMany patients seek orthodontic treatment to align crooked and crowded teeth. The decision that the orthodontist must make in evaluating such a patient is whether or not he / she can align all of the teeth without extracting / removing any permanent teeth. The factors to consider in making this decision are the severity of the crowding, the bite, the thickness and height of the gingiva (“gums”), and whether or not these teeth are already too pronounced (leaning outwards) in the jaws. Certain patients are best treated with braces and the extraction of teeth in order to correct the alignment of the teeth, improve the bite, improve the health of the gums and enhance the smile. The cause of spacing may be heredity or some personal habit like tongue thrusting, thumb sucking, abnormal swallowing, etc. Another cause in adults is advanced gum disease, leading to loss of supporting bone and the teeth spreading out. The spaces can be closed with braces and other orthodontic appliances by moving the teeth together and properly aligning them within the arch. Open bites occur when the upper front teeth don't meet or even cover the lower front teeth. Open bites make proper chewing difficult as it is impossible to bite off food. They may cause speech impediments as well as difficulty to close the lips leading to mouth breathing, and drying and inflammation of the gums around the front teeth. Although many treatment modalities are used in an attempt to correct an open bite, particularly, an anterior open bite, the success rate of achieving correction, proper overlap of the incisors is 80%. In other words, there are 20% of patients who do not have correction of the open bite. 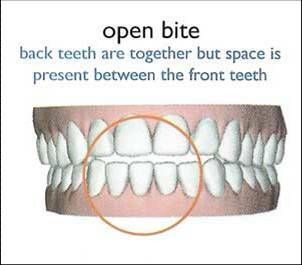 The orthodontic treatments for open bite are used singly, or in combination. These are: oblique headgear, clenching exercises, vertical elastics, posterior bite blocks, and orthognathic surgery. TThere are many possible explanations for the instability of open bite corrections, but the most important is the non-adaptability of the tongue. Most open bites are associated with a tongue thrusting, or reverse swallowing pattern. Therefore, even after initial removal of orthodontic appliances, and the open bite has been correct, the open bite may relapse, return, due to the tongue thrusting pattern. The center lines of upper and lower teeth don't align. This can easily be corrected with braces or Invisalign can be the ideal solution in many such cases. And while Invisalign works for most orthodontic problems, only Dr. Garemani can tell you if this will work for you. IIf pain persists more than a few days, call our office. IIf elastics (rubber bands) are worn intermittently, they will continually "shock" the teeth and cause more soreness. Sore teeth between appointments usually indicate improper wear of headgear or elastics or inadequate hygiene. Wear your elastics correctly, attaching them as you were told. Wear elastics all the time, unless otherwise directed. Take your elastics off while brushing. Change elastics as directed, usually once or twice a day. Retainers are custom-made devices, made usually of wires or clear plastic, that hold teeth in position after surgery or any method of realigning teeth. They are most often used before or after dental braces to hold teeth in position while assisting the adjustment of the surrounding gums to changes in the bone. 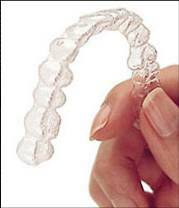 Most patients are required to wear their retainers every night at first, with many also being directed to wear them during the day - at least initially. They should not be worn while eating food or drinking staining or acidic beverages (e.g., Cola products and coffee). When your braces come off it Is very tempting not to wear your retainers. To keep your teeth from shifting and avoiding having to wear braces again, it is crucial to wear your retainers as often as your orthodontist tells you.